Baby Food: Why it’s better to make your own. A Glasgow team have tested 479 shop bought baby foods and found that most of them had fewer nutrients than homemade versions. They also found that the majority of the foods (65%) were sweet in taste, sweetened with fruit sugar rather than sugar itself. Finger foods expecially were found to be sweet. Babies have an innate preference for sweet foods and breast milk itself has a sweet taste to it, however when it comes to weaning we want to be encouraging our small ones to extend their palate. Offering a range of tastes, textures and flavours will do this, by sticking to sweeter tastes babies will be more likely to want sweet foods later in life which could lead to less healthy choices. The nutritional composition of the baby foods was looked at and the researchers found that babies would need to eat twice as much shop bought foods to get the same energy and protein as a homecooked meal. This makes it pretty hard work for a baby to meet their nutritional needs. 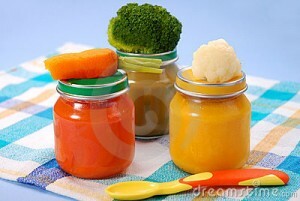 So is there a role for shop bought baby foods and should manufacturers be changing their meals? I would say there still is a role for these foods. We all need a balance of foods in our diets and being a mum I know full well that there are occasions when a pouch or jar of baby food can be so much easier. Try to stick to homemade meals as often as you can and keep the bought versions for those emergency occasions. I’ve certainly used bought baby meals when abroad on holiday for example and when out and about with no other options. My top tip would be to aim for 80% of the diet to be homemade, be realistic about your time, plan meals, cook in bulk and freeze and don’t beat yourself up if you resort to shop bought food now and again. Why not check out some of my weaning recipes or check out my Baby Weaning Ebooks. I used to love making my own babyfood – so satisfying knowing exactly what your baby is getting nutrition wise ! Oh, Yes! It is still best to make food for the baby from scratch. Instead of always spending for the baby food, why not spend one time, big time for a baby food processor that can last for many years? Agreed, however I found a £5 cheap hand held blender was great for making purees and for baby led weaning I’ve not needed any equipment. So I don’t think it has to be expensive.